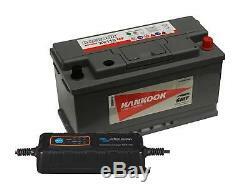 Hankook 110Ah Deep Cycle Leisure Battery & Victron Energy Smart Charger. 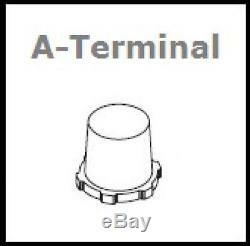 Terminal Type - Standard Post (A). Total Height (mm) - 190. Weight (Kg) - 22.7. Caravans, Motor Mover, Boats, RV, Leisure use and more. This is a Heavy Duty Domestic battery and it's purpose is to run applications with it's deep cycling capabilities. This range of Leisure / Marine batteries are of a lead calcium construction which means the plates have been hardened, therefore giving the battery a longer life and better starting capabilities than your conventional leisure batteries. This battery comes fully charged and ready for use. It is a DEEP CYCLE battery, which means unlike a car battery, they can handle being discharged to a higher capacity and recharged again without affecting the future performance of the battery. Another thing to note about these batteries which is vital is that when charging and discharging they have 250 life cycles. Excellent design handle - Easy battery replacement. Integrated computer designed and reinforced container - Protection from vibrations and impact. Special sealed covers - Prevents acid leaks and minimizes gassing. Totally sealed and spill proof. Maintenance Free - no topping up required. 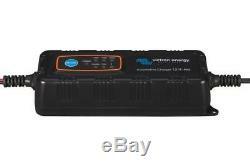 Victron Energy BPC120480034R Smart Charger. 14,4 or 14,7 V. Charge voltage'float' - 13,6 V.
Charge voltage'storage' - 13,2 V. Battery capacity range - Upto 80Ah. 4 A or 0,8 A. Can be used as power supply - No (output relay). 0,25 Ah/month (0,3 mA). Protection - Reverse polarity, temperature. Range - -20 to +40°C (full rated output up to 25°C). Humidity (non condensing) - Max 95 %. Battery-connection - Black and red cable of 1,2 meter. Connects to battery clamps, M6 eyelets or 12 V plug (included). 230 V AC-connection - Cable of 1,5 meter with CEE 7/7 plug. Motorcycle, Car, Van, Golf, Mobility, Leisure, Marine and much more. Depending on the application, clamps, eyelets or a cigarette plug (all included) can be connected to the charger. Charger for 12V batteries with two charge current options: IP65 Charger 12V/4A - 12V/0.8A. Less maintenance and aging when the battery is not in use: the Storage Mode. The storage mode kicks in whenever the battery has not been subjected to discharge during 24 hours. In the storage mode float voltage is reduced to 13,2 V to minimize gassing and corrosion of the positive plates. Once a week the voltage is raised back to the absorption level to? This feature prevents stratification of the electrolyte and sulphation, a major cause of early battery failure. Protected against overheating and reverse polarity connection. The output current will reduce as temperature increases up to 40°C, but the charger will not fail. Output relay protects against reverse polarity connection. S for status and mode indication. When connected to the AC supply the STAND-BY LED will turn on. No voltage will be present at the output. After connection to a battery (battery voltage must exceed 8,5V), a choice can be made out of three charge profiles with the MODE button. Current limited t0 0,8A and 14,4V absorption voltage. The red LED <14Ah will be on. Current 4A and 14,4V absorption voltage. The red LED >14Ah will be on. Application: Flooded, AGM or GEL batteries. Current 4A and 14,7V absorption voltage. The red LED COLD will be on. 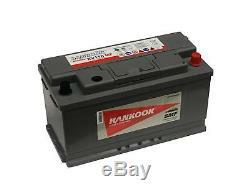 Flooded, AGM or GEL batteries. Ambient temperature below 10°C, or batteries requiring a higher charge voltage (OPTIMA spiral cell batteries for example). Until the battery is fully charged, the red LED CHARGE will be on. After completion of the charge process, the red LED FULL will be on. In case of reverse polarity connection, the red LED! Will be on If the red LED STANDBY remains on, even after pressing the MODE button, the connection to the battery is interrupted. Please note that we are unable to deliver to the following postcodes. AB31 - AB38, AB40 - AB56, KW1 - KW17, PA20 - PA78, PH4 - PH50, IV, HS, JE, IM, BT, Channel Islands & Ireland. Sign up for our newsletter to receive exclusive offers and discounts. Plus be the first to hear about the latest fantastic products and news at Battery Megastore. The item "110Ah Leisure Battery Caravan Camper Van 12V & Smart Charger Quick Delivery" is in sale since Thursday, October 5, 2017. This item is in the category "Vehicle Parts & Accessories\Car Parts\Electrical Components\Car Batteries". The seller is "batterymegauk" and is located in GL20 8NB. This item can be shipped to European Union member countries.